Dead Horse Ranch State Park will celebrate its 18th annual Verde River Day on Saturday, Sept. 30. The park will be open to the public at no cost. The activities during Verde River Day promote preservation and care of the environment by showcasing informative exhibits on the Verde's riparian environment and current recycling efforts. Some of the day's events include environmental exhibits, hands-on-activities, and live entertainment. The celebration brings together 40-plus nature-based exhibits, a menagerie of live animals, non-stop activities from organized canoe rides and sand-castle building to geology tours, as well as local food vendors from 9 a.m. to 4 p.m. Guests of all ages are welcome to fish in the lagoon that is loaded with hundreds of pounds of catfish. No fishing license is needed during the scheduled clinic hours. 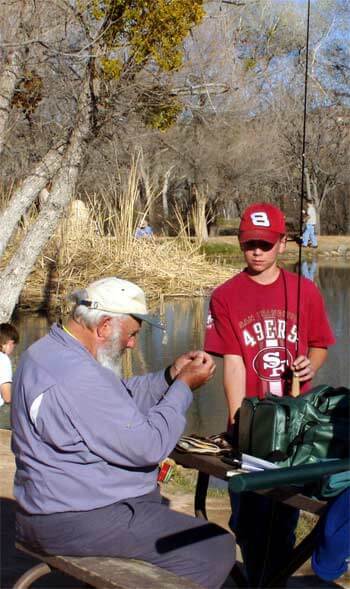 Poles, bait, and tackle are provided for all ages. Visitors may also experience nature's history through guided tours, nature walks, and short hikes. Each year the festival provides hands-on, participatory activities including canoe rides, a horseshoe tournament, and a hands-on pottery session that attracts crowds of participants and spectators. A climbing wall is available for rock climbers from beginner to expert. The event also includes panning for real gold with the help of expert instruction. There will be a vintage trailer club exhibiting teardrop and vintage trailers from yesteryear. group encamped on the park at the west lagoon. promote awareness of the Verde River's distinctive riparian habitat where 85 percent of all wildlife in the area looks for sustenance. held at Riverfront Park in Cottonwood along with a horseshoe tournament. Verde River. Day-use fees into Dead Horse Ranch State Park are waived all day. fee (in Dead Horse Ranch SP) is $12 or $19 with hookups. For more information about Verde River Day, call (928) 634-5283. For more information about Arizona State Parks, call (602) 542-4174. Outside the Phoenix metro area call toll-free (800) 285-3703) or visit www.azstateparks.com.